Kev was in the graveyard one night, chasing moths to take his mind off the terrible hunger, dressed in his formal clothes for no particular reason, when a strange woman walked up and said hello. She and Kev hit it off straight away as Kev regaled her with funny stories. It turns out this woman has a great sense of humour. He complimented her on her exquisite urn. And they shared the joy of silly faces. Then the sun comes up, and his first friend in a long time vanishes like a cloud of smoke. And Kev is left wondering if she was really there at all. Oh Poor Kev! His only friend is a ghost! Lol, haha. Serves him right. ROFLMAO!!! that’s great-the only one that can stand him his a dead woman!! LOVE IT!! I absolutely adore the story you’re building, here! You can even make ghost babies on here, I saw it on a video. Ghost? Or figment of his imagination? Implied, Lisa, or implode ? Looks like the “Ghost” was Miss Crumplebottom..? with her little pillbox hat (no knitting though) Love the story. I really hope Alice makes good. Your story is great! I’m goin to bookmark it so I can keep up with it..
hot damn! after hating kev for so long, how can you make me feel sorry for him all of a sudden?! you are good! You can do. Just remember most of this is made up. He’ll have to control the sims to go here and there. You can download Alice and Kev and run them yourself. I did, and despite Kev hating kids, the first few hours was spent with Kev and Alice playing chase together. But still, this is still a good story blog. This is such a wonderful blog!! I visit each morning to see if it’s updated! You always come up with something interesting! I’m kind of curious myself what would happen if I did something like this.. 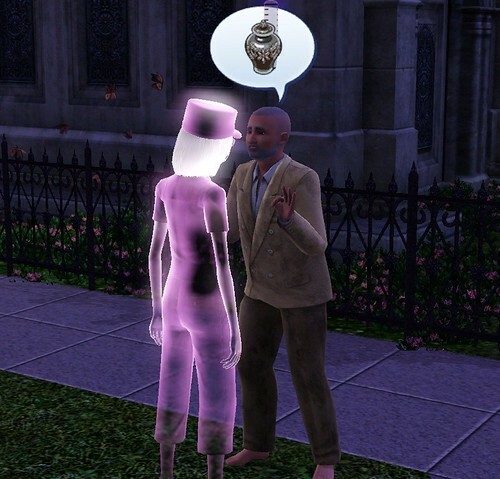 Kudos to you for using the sims 3 in such an amazingly creative way! Aww, that last line made me sad. Wow I found this yesterday and enjoyed the heck out of it. This is just like reading a great book. I can’t wait for the next installment! Do ghosts count as girlfriends? I was wondering the same thing can you have a ghost as a friend or even more than that? I love the story, I agree with Dolphin_girl this is like readin a book. It’s interesting and I can’t wait to get the Sims 3 I hope I get it soon. Yes, they can count as friends/girlfriend …. etc. 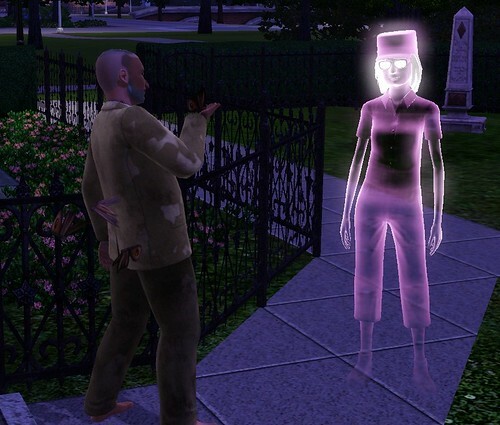 Ghost Sims can even be played. They can get married, and have children. I’m using a ghost sim now. 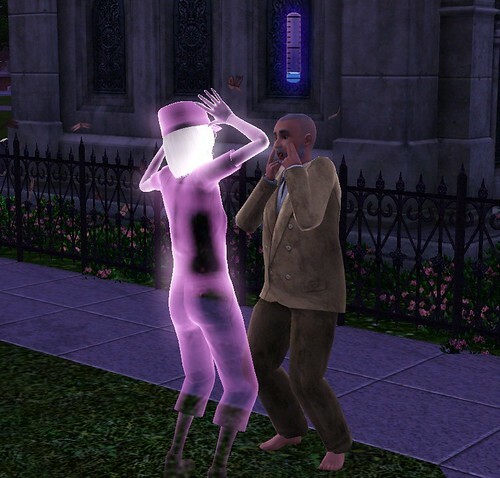 It’s kinda fun, except ghost sims really, really love scaring people. Mine does it to people 3-4 times in a row. This is a great story. I’m enjoying reading this. Wow… this is amazing. I haven’t been able to play the Sims 3, even though I have it(video card should get here Tuesday), and this makes me extra anxious to play! Like so many people have said, it’s awesome how you can turn a video game into such an intriguing story. I usually tell my Sims exactly what to do, but letting them go seems like a good idea now. Wow. I spent yesterday reading your blog from the start and I was really starting to dislike Kev immensely. Now I just feel sorry for him. Hmm, I wonder if this counts as one of Kev’s more sane days.. This is one of my favorite updates so far. I hope his ghosty friend comes back! Lol its a writers job to convey emotions like that, ones that make you dislike charectors or make you feel sorry for them. I just finished reading your series so far. This whole tale is heartwarming and humorous. Excellent job, I really look forward to reading more! Robin, I did like Dawn Skye did- I made 2 homeless peoples, but so far they’ve only been going to homes, staying as late as possible. Angle would stay in even later then John- eat cereal, wash her had A LOT (like a shower) and try to nap on the couch, then get kicked out. While John- goes straight for the sink to take a sponge bath. He doesn’t get kicked out either!! I never thought about going to the gym to shower, but I HAVE tried to have them get food from gardens the only problem- I still haven’t found 1 home w/ a garden! I LOVE this story. I was so angry with Kev and didn’t like him at all, but I did feel a little sorry for him at the end. Your story telling is amazing and I will now be checking ur blog regularly for updates. Also, I agree with a lot of other commenters on here. I am going to loosen the reigns on my sims and give them the weird traits. I think the inappropriate trait will be one of the first ones I try out. Robin, your blog is simply brilliant. Poor Kev… For now, anyway. I’m sure as soon as he gets home to Alice something will happen and I won’t feel sorry for him. Oh-I will also add I have made a homeless family as well. A father, toddler, and child. But now they’ve just made a habit of staying at the public pool because they have a shower and somtimes people leave a picnic basket there. Whoa! I’m really into your story thing. Its great! I feel across it while I was aimlessly browseing the good old tinter web when I cam across this and I’ve got really hooked to it!! I really wonder when the two of them (or at least Alice) finds out they can sneak into the fitness club next to school to shower and steal snacks, as the security is a bit sloppy and more importantly… they even got almost cozy benches noone will mind. I did that when I played a homeless family too but this story is actually in riverside and the gym there has no fridge and no benches…its a step down. But still free showers which is something that will get alice kicked out of a house for sure. I downloaded them and Kev is MARRIED to a surper hawt millionaire! I think it is because she is desperate for a man. Lol. Alice is Leader of the free world and married to her dad’s wife’s brother! Akward! 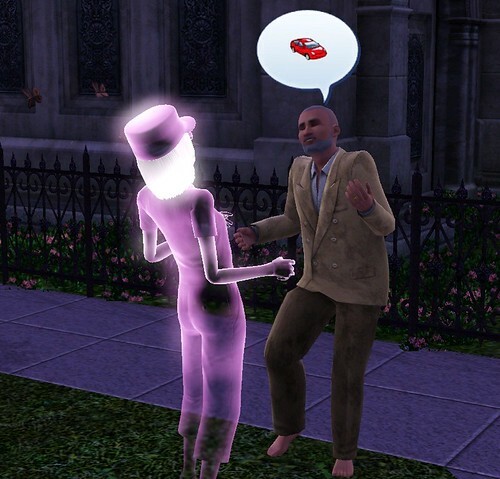 I have a question, if a sim dies do you always get a ghost?? even if they die of old age?? this is in sims 3 by the way. But i have to say i LOVE this story, it’s so amazing!! i love what you’ve done with the characters!! but yeah, if you could get back to me on the whole ghost thing i’d really appreciate it. From the Prima Guide: only if you leave the tombstone/urn on the lot. I left mine in the cemetery. I think it was three days later that I got the call. I check here everyday. It’s weird, but it’s kind of a highlight for me. 😛 You are a great storyteller. Ahh! I check this everyday about 5 times a day hoping for updates. And you’ve made me want to buy the Sims so much, even though I’ve never played any of the Sims. I’ve never even been interested. Now I’m like saving money and planning a trip to Best Buy. Keep up the amazing job you’re doing! And thanks for the great story. Been following your story for a few days now. Excellent and entertaining. And congratulations for being on the Sims 3 website front page! I just read this story to my fiance and he loved it as much as I did. He says you should right a book. You are incredibly talented! I think it would be interesting if the ghost was considered to be Kev’s dead wife/Alice’s mother. OMG Catherine! That’d be awesome! That would explain the obvious repoir they seem to have..
That would make complete sense if the ghost were the mother! That’s a great idea. This is a great story and you should be proud. This part especially. You are a great storyteller. Have you considered publishing this when it’s done? hmmm, this story is taking a turn. Amazing story so far, fantastic job using the screenshots to add to the story, i especially liked thge bits about ninja trashcan kicking and kev looking like a jelly fish. it really got me laughing! Well, it looks like he was actually nice for once, even though it was with a ghost. I have been following this story from the start. It is AMAZING! I wanted to try and do the same in Sims 3 myself, but decided not to. This is just to good for me to touch. Oh, my, God! You are doing such a wonderful job right now, mate! I am really wishing that Alice and Zebreadis dude end up together! That would be such a happy ending for Alice after that cruddy childhood. You mean Zedidias. Yes, I hope for that too. They look so sweet together! Aww…watching them bond was so sweet. Anyway, awesome blog! Keep up the good work! 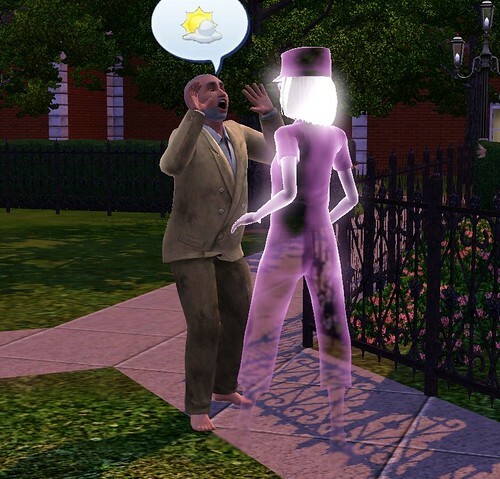 poor kev can you control the ghosts in sims 3? yeah, that’s the down side of being friends with a ghost…. they always seem to disappear at one point or another. Poor Kev! This just gets better and better! I’ve always appreciated fun social play aspect of the sims but I never thought it would be able to support or create a story like this! ha ghosttyyy. too bad hes not klepto… he could take her grave/urn/whatever and put it in his.. park. then he could see her every night!! This is so cool! But how do you make them homeless? Don’t you have to pick a house for them to live in? Please help me because I’d like to try this for myself! Hmm.. Tons of comments are regarding a dislike towards Kev, and how he deserves things like this, but I donno’…shouldn’t we be feeling sorry for him too? His role in the story is of course a menacing one, but it isn’t really his fault he’s insane, now is it? You wrote that so well I put it on a par with my other all time favourite quotes. We’re talking Bright Eyes lyrics. Do you write songs?